No title. [China and Japan.] - PTOLEMY, C.
Title : No title. [China and Japan.]. 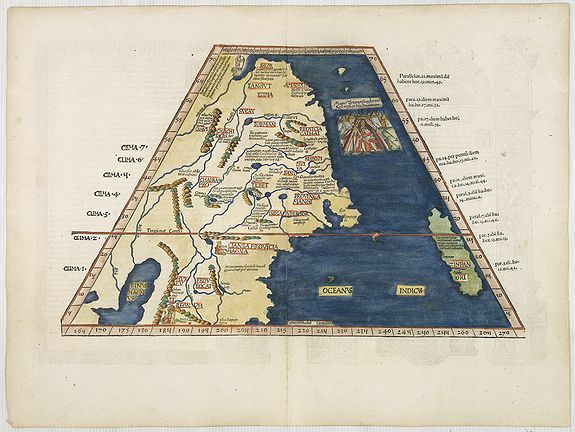 Map maker : PTOLEMY, C.. Date : Lyons, M. Servetus, 1535. Size : 12.3 x 16.9 inches. / 31.2 x 43.0 cm. Description :The earliest printed representation of the China and Japan region in a European Atlas. The first issue of this engraving with minor titular amendments appeared in the 1522 Strasbourg edition of Ptolemy's Geography with subsequent editions in 1525, 1535 and 1541. The map draws from information derived from Marco Polo including Tibet (Tibet), Cianba, Bangal (Bengal), Mangi (Manchu) Tangut and Cathai (Cathay) shown in present-day Manchuria. A conical-shaped Japan taken from the earlier outlines of Contarini and Waldseemüller appears off the coasts of China, a note indicating that its people are idolatrous and totally independent, not playing the customary tributes to the Chinese Emperor. Condition : In very good condition, with wide margins.